Training Tours combine advanced coaching with a tour of the rural New England Berkshire Hills of Western Massachusetts and Southern Vermont. Click on any course below or read the FAQ page for details. 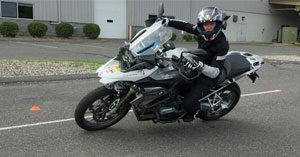 I will be your personal tour guide and riding coach during these one or two day on-street training tours. 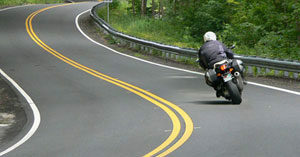 I will show you a good time as we tour the beautiful New England countryside on many of my super-secret twisty roads. You will certainly enjoy the memories of a great day or weekend ride, but even more importantly, you will gain greater confidence and control. Unlike parking lot courses, on-street training is done at real world speed and in real world conditions. We will use Bluetooth helmet communicators for real-time coaching while we ride. Tours are available on weekdays and weekends. Contact me to discuss your schedule and payment methods. I had an excellent coaching ride with Ken recently. 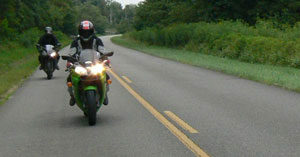 We rode through NW MA and SE VT, on some fine twisty country roads. Just what I like. 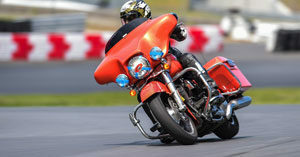 I started riding motorcycles about 40 yeats ago, and now at 68, I am still going strong. Every year I try to find a new learning experience to extend my skills and stay sharp. Ken uses a bluetooth communicator to coach you as he rides behind – observing what you’re doing – and not doing. He really helped me improve my slow speed tight maneuvering. He took videos as we rode and when I watched them at lunch, his feedback that my medium and high-speed turns could be smoother made a lot of sense. During the afternoon, I could really feel the improvement. I would recommend Ken to anyone looking for a good way to advance their skills. A testimonial from Kathy L.
Our training day started at Elmer’s Store in Ashfield where Joe, the other rider, and I filled out an evaluation that did a good job of helping me determine where my weaknesses were and where to focus. We then talked with Ken about our responses which help Ken set the tone for the day in terms of exercises and the route itself. For me that turned out to be an important process as the route was changed based on that conversation. A route that seemed to be tailor made for the very things I needed to work on. The first stop was the Ashfield highway department parking lot where we practiced low speed tight turns and emergency braking. I ride a Yamaha Warrior which is not known for its nimbleness but I was able to get the bike to comply pretty well when I followed his instruction to fully twist my head around and up. Almost an epiphany moment. The next exercise was harder for me. We did emergency braking with a fixed point and also with Ken choosing our moment of reaction. He was very patient and I lost count on how many times I went around to try it again but I did get to a point where my head understood what to do but my reacting muscles were not able to cease from going into a harder lock down than was needed on the back brake. The important lesson from this exercise was the importance of practicing these on a regular basis. Ken did a good job of hammering that home. After this phase of parking lot work was finished we headed out for the open road part. Some very interesting things came out of this part of the program. Ken noticed very quickly that I was sitting crooked on the saddle. This was subconscious on my part but it was so pronounced he asked me if I had a spinal injury. After assuring him I did not we went about trying to figure out what it was happening. It turned out that the ol’ wallet in the back pocket routine was to blame so I removed the wallet and began the process of making myself sit straight even though it felt odd. Another eureka moment. 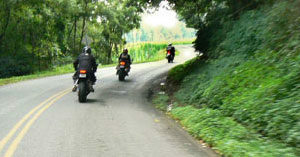 As we rode Ken spent more time leading and demonstrating positioning and braking into corners. This allowed me to first try and emulate his moves as I listened to him describe them on the radio. During this time Ken would also talk about what was happening on the sides of the road to expand our sense of awareness about what might happen ON the road as a result of what was going on off the road. Then, taking turns Ken would have Joe or myself take the lead where he would continue the commentary and also capture our activity on the ProCam. The terrain, road conditions, traffic and distractions were all there to provide a good variety of situations that kept us focused. At that point we broke for lunch and enjoyed superb food and great conversation which included many topics and not just riding which helped us relax and enjoy the break. Back on the road now Ken took us back to a particularly track like set of curves on a recently paved section of a ridge road running along side an industrial wind farm. Nice backdrop! Here we took turns going through these curves with Ken on our heels and with his usual excellent commentary all the while filming our every move. After that it was a leisurely ride home with little to no comments about what we were doing leaving us free to practice what we had learned without too much distraction. At the end of the ride I was treated to an incredibly in-depth review of the video taken of me during the ride. This was the first time I had an opportunity to see myself on a bike and to do so with Kens experienced insight was an extremely useful and rewarding session. It was indeed the highlight of the day. I was very impressed with the whole program. 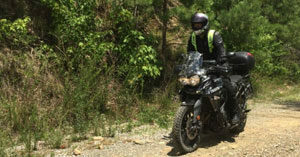 Ken is an outstanding instructor and a pleasure to ride with. As an intermittent rider who took motorcycle training when I got back on the bike this experience was way beyond what I received from my prior training and was really necessary to discover and mitigate some of the many bad habits I had acquired over the years. 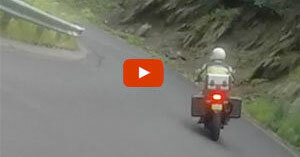 Something that every rider should consider. I’m glad you liked the MCN article. As you know, it takes creativity to reach those tough students. It sounds to me as though a key part of learning may be missing, which is to communicate how doing things the way you suggest will make riding easier. Be specific about the benefits and then reinforce this if they seem not to get the concept. Once the concept/benefit is truly realized, then they will be motivated to put your coaching into practice. Without this meaningful motivation, you are relying on them to simply “Do as I say”. Be sure that you focus on effectively communicating what the student NEEDS, rather than simply telling them what they SHOULD DO. These are 2 different things, sometimes. Yes, we need to follow the curriculum, but the goal is not for a student to do the exercise “right”, rather to follow the curriculum as a guide to help them to build their skills. An example: If a student is looking down, you may ask them to give you examples in their life where looking ahead helps them to achieve a goal. (playing tennis, skiing, walking around a corner, etc.) 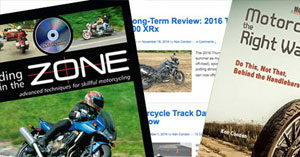 New riders often “get it” if they can relate to how riding a motorcycle relates to things they already know. Think of these problem student as facilitators to expanding your coaching prowess. If they aren’t getting it, pull a different tool out of your box and try it.